Visit Sara at Craft Test Dummies. Take out that box of old photos and create your own Vintage Photo iPhone Case. Mixed media ideas may seem complicated, but this project shows just how fun and easy they can be. Pick a meaningful image and use it for your project - it's a great way to keep someone close at all times. In addition to the photograph, you can customize your project with a variety of embellishments and alcohol inks. The understated colors and old school look make this a true stand out. You can find this project, as well as many other fabulous blogger projects, in our new eBook, The Best Blogger Craft Ideas 2014: Decoupage, Sewing, Jewelry Making, and More free eBook. Download your own free copy today! Use Ranger Alcohol ink on clear iPhone case in ginger, caramel, butterscotch and pitch black. Trim, "relatives card," to size of iPhone template and adhere to inside of case using Mod Podge. 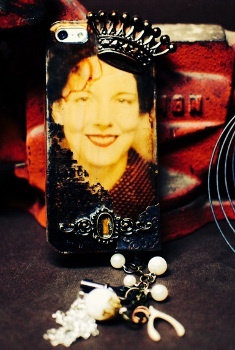 Use Tim Holtz Elements remnant rub-ons on outer portion of iPhone case and seal with Mod Podge. Use krazy glue craft to adhere metal embellishments to front cover. While cover dries, use jump rings, Ideaology pearls, adornments, keys, wishbones and plastic mic plug to create hanging charm. Fill idea-ology key hole with copper pearl liquid pearls. Wait to dry and insert iPhone into happy vintage fun-ness!